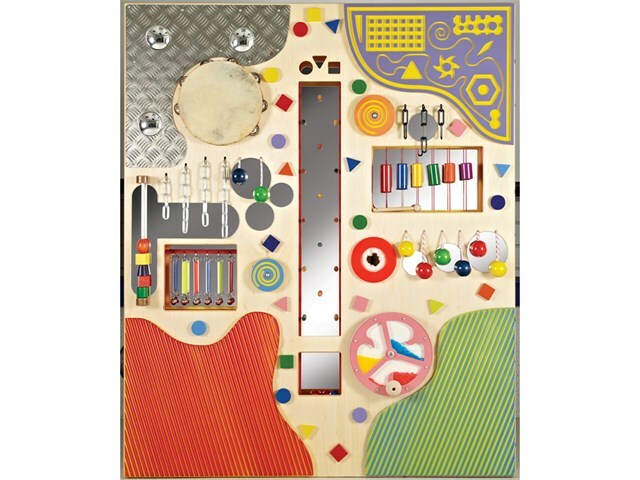 The Acoustic Tactile Wall Panel is an interactive wooden board which has been carefully designed for use in a sensory environment to maximise visual and tactile stimulation for learners of all ages. 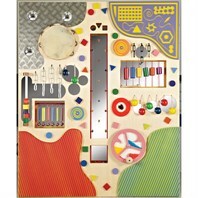 This panel has many acoustic as well as visual and tactile experiences; beat the wooden chimes, ring the fluorescent mirror bells, bang on the tambourine, turn the mirror rattle disc, see funny faces in the mirror disc, drop the coloured shaped blocks through the sort and shape holes to hear and see them clatter through the pegs to the trough below – the interaction opportunities are endless! Suitable for fixing to any wall with the supplied brackets. Product is to be used under the supervision of a professional/responsible adult at all times. Dimensions: H150cm x W120cm x D20cm.